IncrediMail is an email mail client, which allows users to send multimedia emails right from the desktop. It is a desktop application that acts as an email reader and communication program, i.e. communication platform when in connection with internet and reader of the existing messages (read mails), when not. The user-friendly graphical interface of the application also makes it used widely by users. IncrediMail manages email transactions, communications, messages, etc. Interesting feature of IncrediMail is that it allows to manage different web based accounts like; Gmail, Yahoo, etc., on its platform. Emails generated/exchange using IncrediMail are stored in .imm format. Other default file extensions of IncrediMail are: .ima, .imb, .ime, .imf, .imh, .imi, .imn, .imr, etc. IMM – The file format stands for IncrediMail e-mail storage. It stores only text files and owing to the same fact, it can be opened using text editor too. For each corresponding folder existing in the IncrediMail account, there is a corresponding .imm file for it, i.e. ; Inbox.imm, Outbox.imm, etc. Also for each copy of .imm file there appears a .imh file. An IMH file stands for the header file and stores header contents of the corresponding .imm file. IncrediMail loads both the files concurrently (on the backend) on the account being accessed, to display the email storage to the user. How To View An .imm File? IMM files are found only in IncrediMail desktop mail client. IncrediMail has the facility to manage different accounts as mentioned earlier. All the mails configured will be stored in .imm format. So far, there is no standalone platform to read an .imm file except for IncrediMail itself. So, need to rely on third party application arises. Usually third party applications are suggested to view .imm files without IncrediMail. One such application is Incredimail .IMM Viewer. It is a standalone program, i.e. it is capable of reading and displaying .imm file contents without the help of IncrediMail. The software runs without IncrediMail and thus, makes it easier for users to read the mail storage. 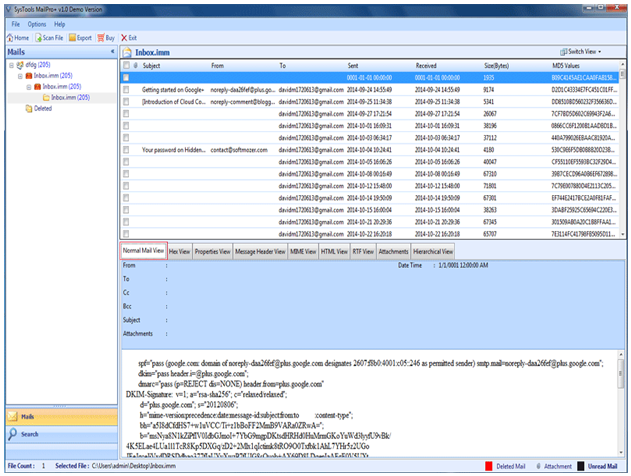 The software allows viewing a single file, bulk files and also permits searching the file(s) of IMM type on the disk. Incredimail to Outlook Viewer allows different views for a single mail i.e. Hex View, Properties View, etc., for respective purposes. The unique feature of Incredimail IMM to Outlook Converter software is that it runs without the support of the IncrediMail and so it is an independent product. The Software allows viewing the attachments along with the corresponding emails. There are different kinds of views available such as Normal View, Hex View, Properties View, etc., serving a purpose each from a forensic examination standpoint. It provides two modes of view to the users, i.e. “horizontal” and “vertical” and the software is well understandable and easy to work with. The file contents are separated by attributes such as; size, to, from, subject, etc. 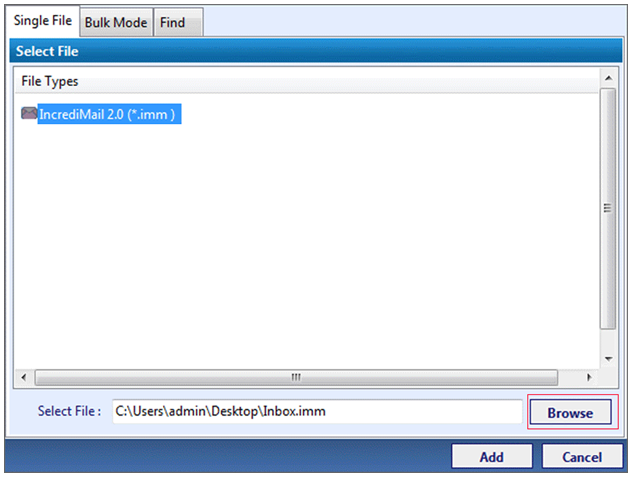 The most peculiar feature of the tool includes its ability to allow user to Incredimail IMM to Outlook PST file. Observation: The software for viewing .imm files was so far not found. However, Incredimail .IMM Viewer bridges the gap with its existence by letting users read IMM files without external support required. The application is built with different modes to view IncrediMail messages for a detailed examination of the source, sender, etc. It is built on a powerful algorithm and yet designed in a user-friendly manner. The trial version of the IMM to PST Converter software is available for free with which 50 emails can be viewed but, you can overcome the limitation via purchasing the full version.